I barely noticed the little tree out front. Like a sentry, it has stood silently upright for a year, in the strip between the lawn and the street, guarding the house. Now that the days are longer, you’d think I would have noticed it more. But sadly, I haven’t. I’ve taken it for granted, or worse than that. I’ve not seen it as distinguishable from the view Out There, beyond my front window. If the tree had feelings, I’d say I know how it feels. But suddenly it has erupted into a frenzy of red blooms. 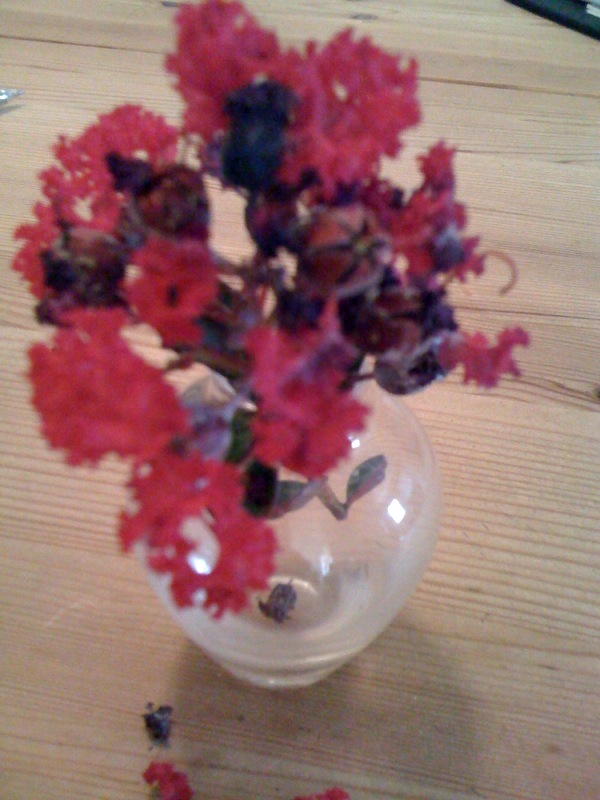 Pink red, to be exact, like dark watermelon or some varieties of geranium. It makes me so happy I want to bury my face in it. If it were larger, I’d climb it, but it’s not big enough yet for human exploration. I wonder what it is? I recognize some local trees, but not this one. I snap photos and iPhone them to my gardener and nature lover friends. Do you know what this is? One friend who lives in Ohio and worked at a botanical garden said it looked like a plum tree, but plum trees bloom in the spring, not the summer. She said it looks more tropical. My other friend who teaches nature writing doesn’t know either. So I’ll break off a few leaves and blossoms and take them with me to the nursery. Now that the sentry has shown its colors, I want to fully acknowledge it. And I want to know how tall it will grow. How many years will it stand? And does it have to be protected from seasonal hazards? Bugs, traffic and fire pollution, drought? It seems to be doing fine without water, so far anyway. According to the cute guy at the nursery (a bonus for my visit), the tree is a crape myrtle, also known in more recent years as crepe myrtle. 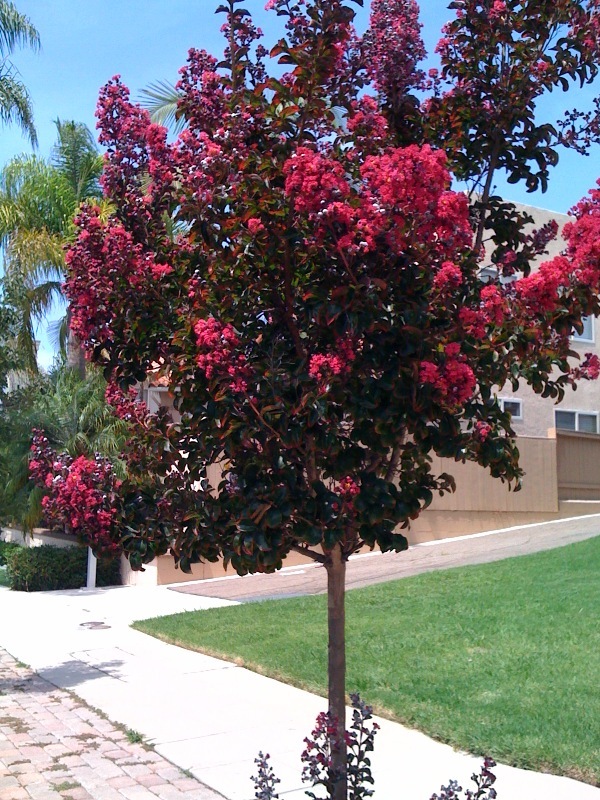 It is an evergreen shrub, drought resistant, and often used along our San Diego sidewalks. It does well in all warmer climates around the world, having come originally from Southeast Asia. It can grow up to 25 feet tall and even taller and makes a nice shade tree. It often has more than one trunk. Its flower petals are crinkled, like crepe paper, thus the name. It is one of the longest-blooming trees, from July to September in our hemisphere. It is slow to grow, but can live as long as 150 years. In mythology, the myrtle tree is associated with Venus and is a symbol for love, peace, fertility and rejuvenation. Sounds good to me! And I salute you from now on. Previous Previous post: Pssst … Have You Heard?